This ticket includes 3.5 hour sunset boat party + 4 drinks included. Boat sails San Antonio Harbour 3PM - 6:30PM. Meeting Point is Rio Bar, San Antonio Seafront 1:30PM onwards. Last adnittance 2PM. !!! OPENING BOAT PARTY SPECIAL !!! 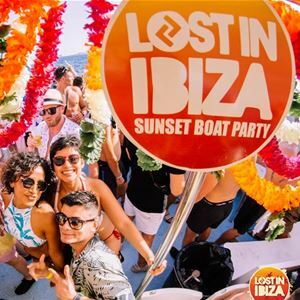 LOST IN IBIZA is famed for throwing LEGENDARY boat parties. With SUPER STAR DJ'S, straight off club lands most-wanted list every week!! 3.5 hour boat party + 4 FREE drinks + club entry to JAMIE JONES' PARADISE OPENING @ DC10 + free bus TRANSPORT to DC10. Everybody dreams to get lost in Ibiza - Get Lost on a magical journey of a lifetime. ABODE storm into their second season at AMNESIA. The PERFECT PARTY with monster line ups every week keeping the hungriest clubbers stomping til sunrise.